Can you remember a time when everyone used the same instant messaging app? Even before the age of social media, there were always multiple contenders: you may have preferred ICQ, but some of your friends were on MSN Messenger, some used Yahoo! Messenger, and others stuck to AIM. These days, IM is more mobile than ever, and you probably have two or more messaging apps on your smartphone. But what happens when you want to chat from your Linux computer? Ring is best described as a free and open source Skype replacement. Unlike Skype, it cares about your privacy, so all messages and calls are encrypted, and the developers claim that no files are saved on their servers. Ring has it all: video and audio calls, regular instant messages, group chats, and call recording. The installation is fairly simple, as Ring offers pre-packaged installers for several Linux distributions. However, it requires a daemon (background service) and a client, so make sure to install both. Once you start using Ring, it will generate a Ring ID for you. You’re supposed to give it to your friends so they can add you as a contact. You can have multiple Ring accounts, and the Settings dialogs are quite detailed, with options for auto-answering calls, audio and video codecs, chat history, and of course, encryption. Ring achieves secure, decentralized communication thanks to OpenDHT and GnuTLS libraries. It also supports SIP (Session Initialization Protocol) accounts, so after you create one, you can use Ring to call landline and mobile phones. 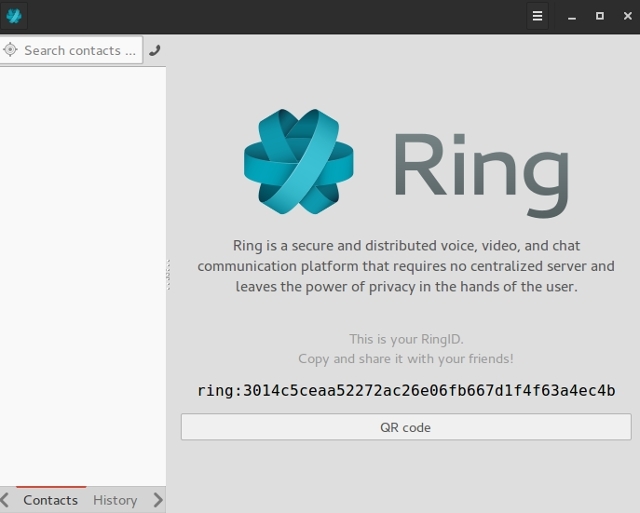 Ring lets you put a call on hold, share your desktop with the caller, and send files to other users. With features like these, plus the ability to make conference calls, Ring is perfectly suitable for small businesses and remote workers. Since Ring is still in beta, some features are missing, like the (arguably essential) option to manage your contacts. Linux users can work around this problem by using the Evolution Data Server to provide contact information to Ring. Others will have to wait a while, or start using Ring anyway, because it’s already a great app. Google doesn’t seem to care much about making a Hangouts desktop client for Linux. Sure, you can use Hangouts in the browser, but it’s not always a pleasant experience. Luckily, people have taken the matter into their own hands and created YakYak. Despite the somewhat unfortunate name (it sounds a lot like Yik Yak, another messaging app), YakYak isn’t bad at all. It supports group chats, native desktop notifications, and multimedia integration. YakYak is not a traditional desktop app; instead, it’s a “wrapped”, windowed version of the web app created with the Electron framework. This makes the YakYak client relatively big – when unzipped, it takes up over a hundred MBs, approximately two times more than GIMP. Still, it gives you everything that Hangouts has, plus additional color schemes. You can preview the chat history, change your presence status, and get notified when other users are typing. YakYak doesn’t support multiple Hangouts accounts at the moment. If you’re not happy with it, but don’t want to use Hangouts in the browser either, consider the purple-hangouts plugin for the trusty old Pidgin. If you follow tech news, you’ve probably heard of Franz, as it generated quite a buzz when it came out earlier this year. The strength of Franz is in numbers – it supports more than twenty messaging services, from well-known ones like Skype, WhatsApp, and Twitter, to HipChat, SteamChat, and even some of the services from this article (Mattermost, Rocket.Chat). Franz is truly a one-stop-shop solution. If you have to use multiple messaging services, but don’t want a dozen different chat apps, Franz just might be perfect for you. The way Franz works is simple, but also somewhat disappointing. Like some other apps on this list, it’s not really a desktop app; rather, it’s a wrapper for the web interface of each supported service. Basically, using Franz is like using a stripped-down web browser that keeps messaging services running in their respective tabs. This affects the app size, and more importantly, its memory footprint. Nevertheless, Franz boasts some redeeming features. Apart from sending instant messages to your friends, you can also use it to check email with Gmail and Outlook. 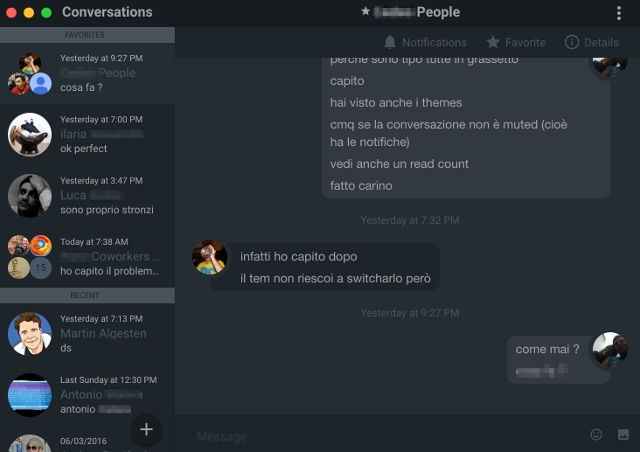 Desktop notifications will alert you of new messages, and the app itself has been translated into a few dozen languages. Possibly the best thing about Franz is the ability to use multiple accounts on the same service at once. Yes, this means you can – finally! – switch between all five of your Twitter accounts in one window. Telegram is one of the new messaging services – it appeared about three years ago. 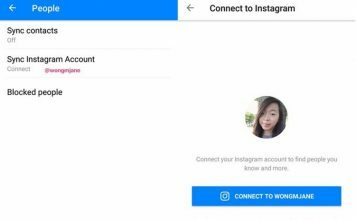 Like WhatsApp and Viber, it’s primarily a mobile service, which means you have to create an account with your phone number. Telegram lets its users share files (including images and videos), create channels (public chat groups), and use one account on multiple devices. Although the client code is open source, Telegram is a proprietary application, and it has been heavily criticized for some of its security choices. 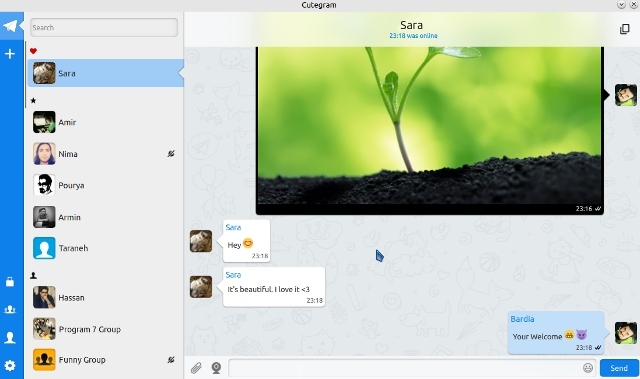 Still, if your coworkers or friends insist on using Telegram, the alternative desktop client called Cutegram will serve you better than the default one. 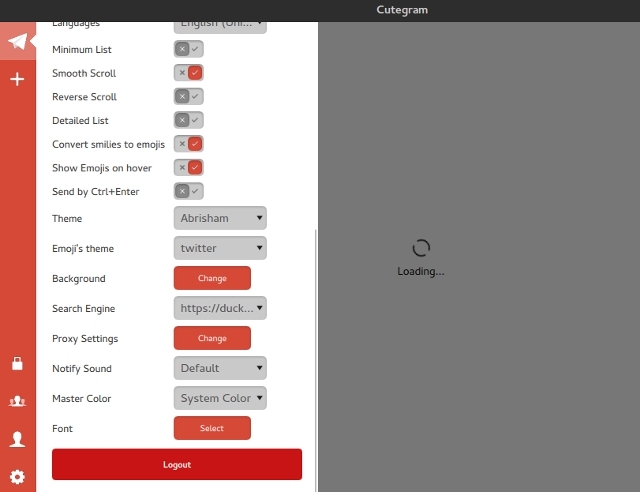 Cutegram offers packages for several Linux distros, alongside a generic Linux installer file. On first run, you’ll be prompted to enter your phone number and connect your existing Telegram account to Cutegram. Everything else is pretty much smooth sailing, as Cutegram prides itself in being user-friendly and adapting to your desktop environment. You can send files to your friends, organize contacts into groups, create private chats, and mute annoying people. The Settings dialog lets you tweak some visual details, as well as adjust emoji-related options. 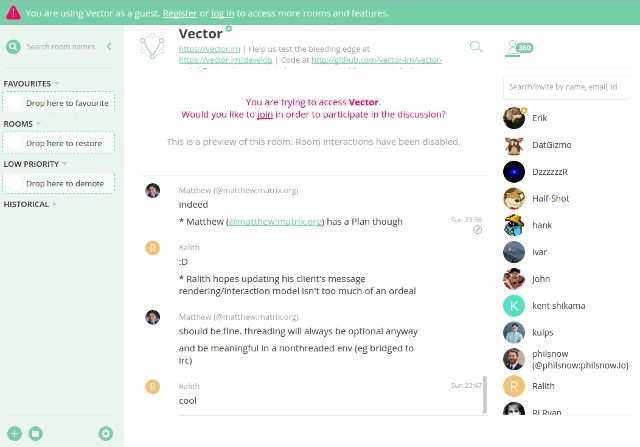 Vector just might be the only chat application you’ll ever need. Video calls? Vector has that. Group chats? Check. You can share files AND it’s all encrypted? You bet. Plus, it’s completely free and open source. Vector is actually a client for the Matrix protocol, an open standard for decentralised, real-time online communication. Matrix allows anyone to install and run their own server, and those servers can then connect to the public Matrix network. There are also network bridges or integrations, which make it possible to connect to IRC, Slack, XMPP, Skype and other services. If you’d just like to give Vector a quick try, you don’t need a server; in fact, you don’t even need an account. Simply load the online version to access any of the public chat rooms. You’ll notice the interface is Slack-inspired, but somewhat simpler. If you like what you see, create a free Vector account. Then you’ll be able to make chat rooms, start conversations with other users, invite your friends, share files with them, edit messages… Developers can play around with bots (to automate activities on a channel) and integrations with services like GitHub and Jenkins. Vector is still in development, so only a few integrations are available for now. Still, it shows a lot of potential and it could easily become a full-fledged Slack alternative. Most people would agree that complete anonymity is impossible if you intend to do anything online. However, there are some measures we can take to protect ourselves when necessary, and Ricochet aims to make this easier for the average user. It takes a different approach to security than other apps on this list by relying on the Tor network to relay messages between users. The best part of the story: you don’t need to set up Tor manually, or even be particularly knowledgeable about it. Ricochet takes care of everything for you. 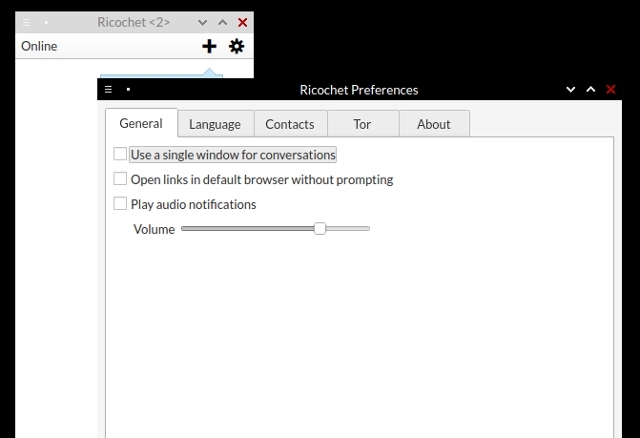 After downloading and decompressing the Ricochet archive (ricochet-versionnumber-static-i686 or ricochet-versionnumber-static-x86_64, depending on CPU architecture), simply run the executable Ricochet file. The app will ask you to either configure the network settings manually or let it do the work. You’ll get a unique Ricochet address that others can use to contact you. This address is the only part of your identity that’s visible to other users – your contact list is stored locally, and your location, IP address, and messages you send are not exposed to third-party servers. If you’d like to know exactly how Ricochet does this, feel free to peruse the official documentation. At present Ricochet doesn’t support file sharing, and the developer warns about the experimental nature of the app. However, it’s still completely usable as a regular messenger app, and it’s worth trying if you truly care about privacy. Slack is great, but it’s not open source. 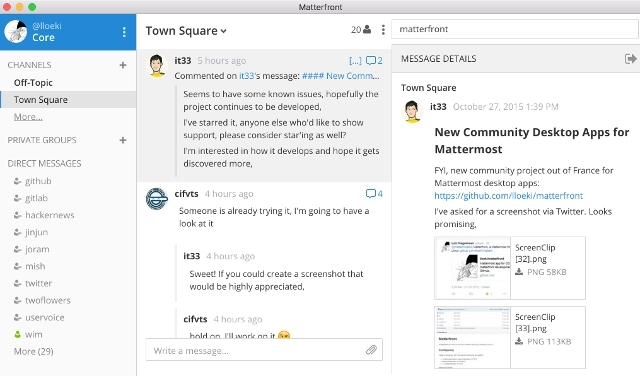 If this is something that matters to you, Mattermost is probably the best Slack alternative you can find. With file sharing, Markdown formatting, and of course, emoticon support, Mattermost has everything you need for efficient collaboration. Mattermost is self-hosted, which means you have to run a Mattermost server, and then install client apps on your devices that will connect to it. On Linux, you’ll need a desktop client. Once it’s all set up, you can easily migrate existing channels and user accounts from Slack. However, private chats, files and images can’t be imported from Slack’s database for now. 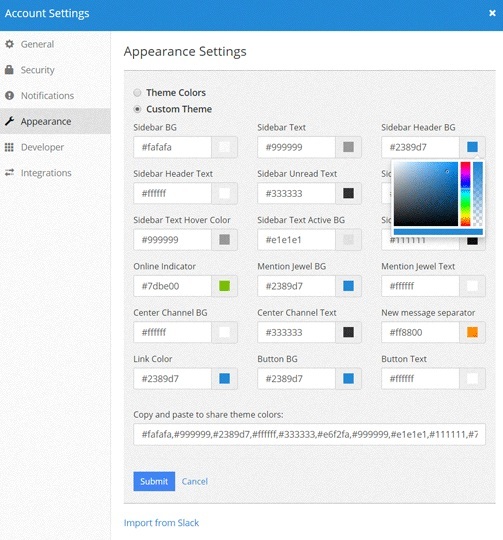 Mattermost pretty much looks and works just like Slack, and you can further customize the appearance by creating your own themes. Mattermost supports integrations with various services and applications, so you use Trello, Outlook, RSS feeds, IRC, and Giphy in your channels and chats, or even create your own integrations. There are also built-in commands like /join, /me, or those for direct messaging and link shortening/expanding. Search is one of the most powerful parts of Mattermost, and the Recent Mentions feature can be extremely practical when working in large teams with quick-paced communication. Speaking of teams, Mattermost allows you to use just one account to join multiple teams, and doesn’t force you to create separate accounts for each team. To top it off, it has fantastic documentation where you’ll find detailed usage instructions. Tox is another privacy-aware messaging protocol. The communication takes place in a distributed, peer-to-peer network, where users can send encrypted messages directly to each other, without any meddling, unknown servers in a faraway land. To join the network and become a Tox user, you need to install a Tox client. QTox is among the best-equipped clients, and it’s the one depicted above. When you start using Tox, the client app will generate a Tox ID for you. This is a long string of code that you can share with your friends, and it lets them add you as a contact. QTox supports multiple Tox accounts, and you can even share your Tox ID as a QR code. 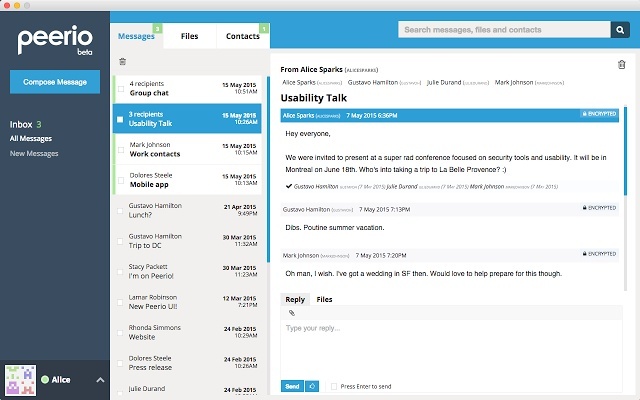 Apart from regular text chats, qTox supports audio and video calls, group chats and group calls. You can send files to your friends, and qTox will automatically show a preview of shared images. 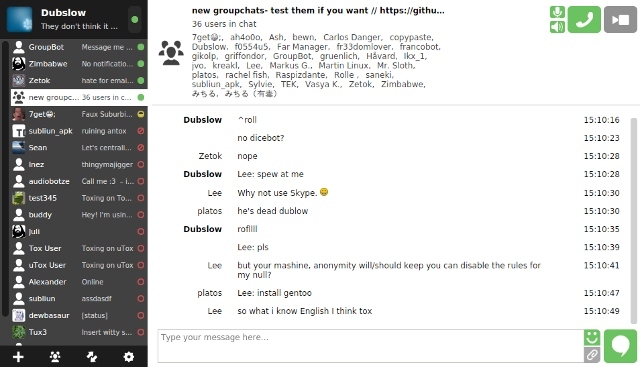 It’s also possible to set up Group Bots that can host chats and invite users who are not otherwise connected. However, you can’t transfer files or make video calls in a group chat. An interesting thing about Tox as a protocol is that all participants in a conversation must be online at the same time if they want to chat or add each other as friends. Some Tox clients, like qTox, have a “faux offline messages” feature that can save a message and deliver it once the recipient comes online. Other useful qTox features include the ability to disable chat history, change interface colors, format messages with Markdown, and quick-quote other people’s messages by pressing Alt+Q. 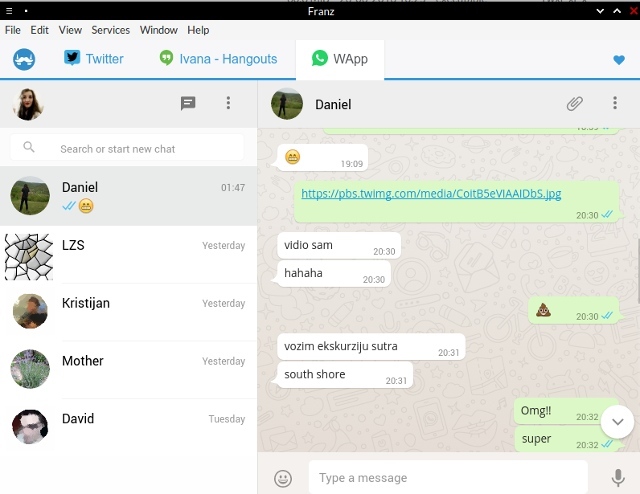 There’s also the multi-window mode which lets you open each chat in its own window; you can rearrange the windows and combine them at any time. Tox is still in development, but it’s quite stable, so don’t be afraid to try it, either via qTox or some other client. Peerio feels like a mix of Dropbox and Gmail with extra layers of encryption. It’s an open source application that seems more focused on file sharing and collaboration than on plain instant messaging, which makes it a good choice for office environments. The free plan gives you 1 GB of storage for files up to 400 MB in size, while the Pro option will upgrade you to 50 GB of storage for $10 per month. Since Peerio puts your security and privacy first, the process of creating an account has a few extra steps. You’ll have to register with a username and email, and create a passphrase. Then you’ll get a confirmation code, which you have to enter at your first login. Finally, you’ll create a device-specific PIN to speed up future logins on that device. The Linux desktop client can be found here, packaged for several popular Linux distributions. Peerio’s only limitation is the fact that you can communicate exclusively with other Peerio users. This means you’ll have to ask your friends to create their own Peerio accounts. 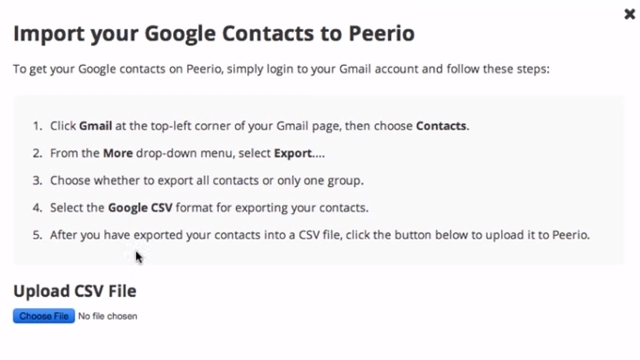 You can import a list of contacts from Gmail to make this easier. After that’s done, you can chat in groups of up to 50 participants, search through all discussions, and exchange files. You can see if others have opened your messages, and even delete the messages you’ve sent from the recipient’s inbox. 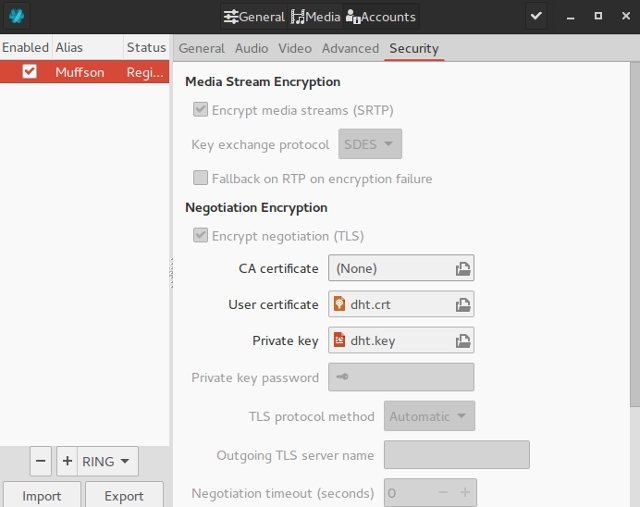 The files you upload are encrypted, and every user gets a unique private key for the active session, which expires once they log out of Peerio. Now, this may sound great, but what if you’re skeptical about Peerio’s encryption methods? Well, the developers have explained it all in the official documentation, so it’s worth checking out if you’d like to know more. 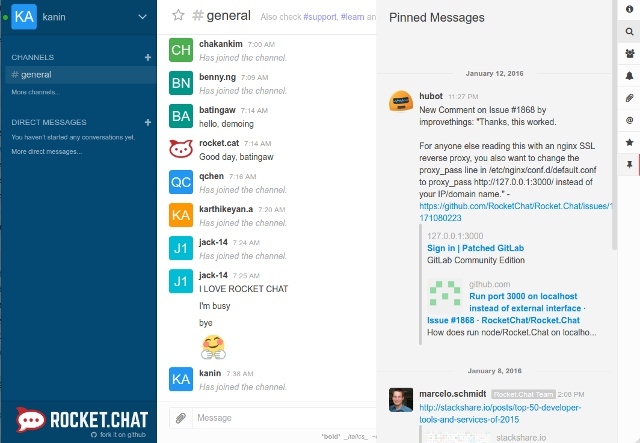 RocketChat is an interesting Slack alternative with a massive list of features. You can message people in private groups or in public channels. 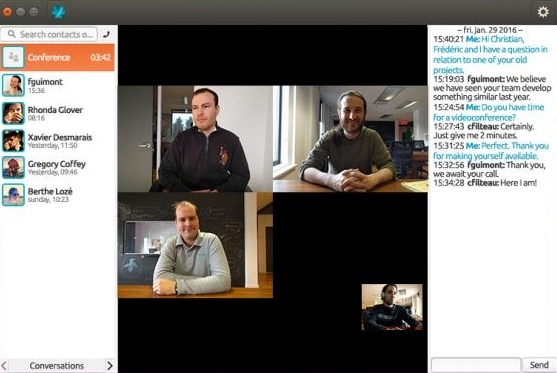 RocketChat supports different kinds of calls – audio, video, and conference. If you post a link, you’ll get an instant preview of its content, whether it’s a photo, a video, or an animated GIF. You can share your desktop with other users, and edit messages after they’re sent. A cool feature is the support for TeX math rendering in case you need to write some serious formulas. 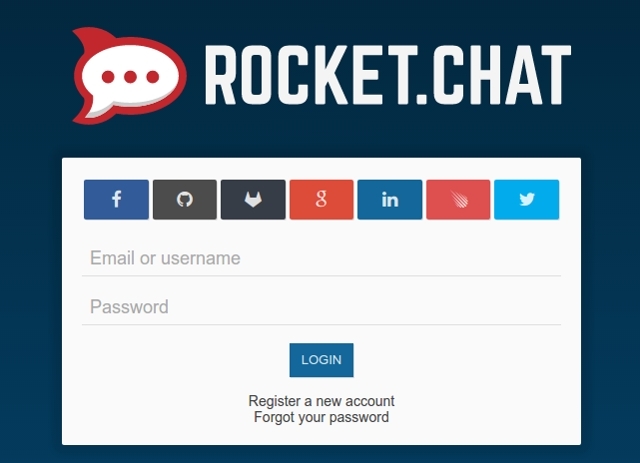 RocketChat has an online demo where you can test it out. Log in with an existing account (choose from the list of supported services) or create a new one to access the web interface. Of course, if you plan to use RocketChat as a Slack replacement in your office, you’ll need to deploy a server instance. The client apps are installed separately on supported devices and platforms. RocketChat is not that different from Slack, and to make migration easier, you can import data from Slack or even set up a real-time Slack bridge, which will mirror the conversations from a Slack channel or group. Naturally, integrations (webhooks) are also supported, so you’ll be able to plug in services like GitHub, Telegram, and Giphy to receive alerts and have fun with GIF reactions in your RocketChat channels. 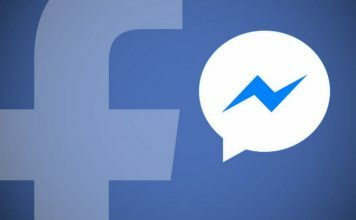 You may have noticed that all these messenger apps have a lot in common. Most of them are open source. Quite a few are focused on privacy. Lastly, some of them are not “true” desktop apps, but rather web apps wrapped in a windowed interface. Do we really need that many messenger protocols and apps? Probably not. 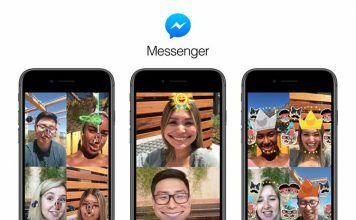 Do we need messenger apps for Linux? This is a question that everyone should answer for themselves, but generally speaking, it’s good to have at least one. You never know when your phone might break, so it’s wise to have a desktop version as a backup. Besides, many people are required to use a chat app for work, which means they need it both on their phone and their computer. If you were not impressed with any of the apps we listed, you could take a look at Appear.in, Actor.im, and Crypto.cat. Or even better – tell us about your favorite messenger apps for Linux. Which ones do you use? Can you recommend a messenger app that we didn’t mention? Let us know in the comments below. Image Credits: Kaiserpinguine mit Jungen via Wikimedia, Ring, YakYak, Mattermost, Cutegram, qTox.